Why should I attend the music course? Children are born with a natural feel for music just as they are born with the ability to learn to walk. The trick is to stimulate this in the period where the child is most susceptible to development. Unlike reading and writing that only comes to the fore around the sixth or seventh year the feel for music comes much sooner and the music course caters for this early start. Children love music and think its fun; perhaps the fun factor is possibly the most important reason to encourage it. Music can also play an important role in child development. It is already known that listening to and making music increases the concentration and that music and sound stimulate motor skills, not only because children clap along or sway from side to side but because there may be a need to reach, to crawl, to walk or to dance. Music can also help in dealing with a range of emotions; sadness, anger, happiness. It can be used to let of steam or offer comfort. Music also plays a role both in the mental and sensory development of the child and equally in the development of stimulating language and speech. The many facets of music have been scientifically proven. When writing or doing maths only one or two areas of the brain are active. With the listening to and making of music numerous areas of the brain are activated both in the left and right side of the brain; the area responsible for speech, the area responsible for motor skills and coordination, the area responsible for emotion and of course the “musical” area . Because all of these functions are needed at the same time during music a good communication line within the brain is important. 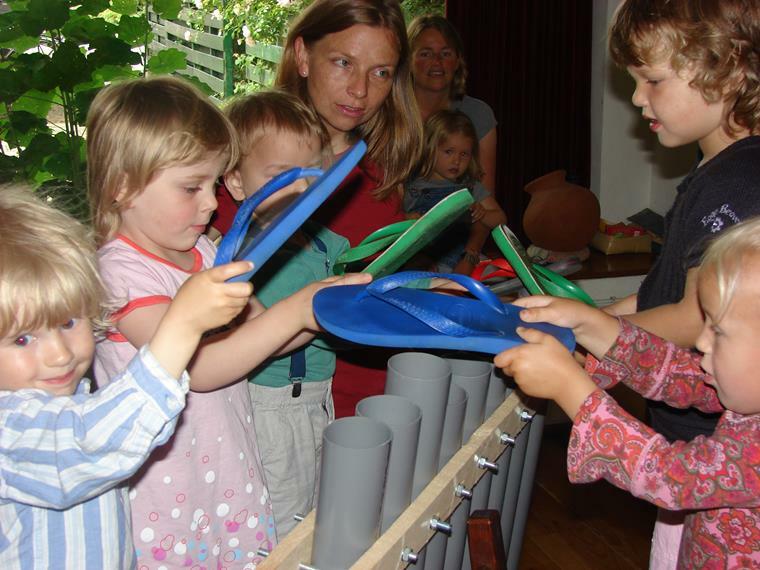 The more music and musical games that are integrated into the child’s life (in a free and easy manner of course!) the stronger this communication link becomes. Reason enough to introduce music at an early age. The most important factor of all is fun because if it’s fun it works and this is what the music course is all about.